Lower interest rates and strong capital growth continue to fuel high demand for Sydney residential property stock, as investors and homebuyers compete for new apartments in Sydney’s middle ring suburbs. Interest rate cuts have increased the “risk appetite” for property and equity investments, despite increasing property prices in Australia’s capital cities. Sydney is on the brink of an apartment boom, with a projected 25,000 additional units to be built before 2018, according to the Commonwealth Bank. More than 35 suburbs, including Hurstville, Mascot and Macquarie Park, will see a significant increase in apartment developments. Off-the-plan developments are experiencing a record number of foreign acquisitions, particularly by Chinese investors. Hurstville is an emerging hotspot on the Sydney property scene – its newest high-rise development, Highpoint, sold 240 apartments in one day and attracted over 1000 people to its launch over the Oct 12/13 weekend. Fabrizio Perilli, executive general manager of Toga Development and Construction, said that the Asian community is one of their main focuses for developments including Highpoint. “Our recent developments, Macquarie Central, were sold out in a short timeframe. That was largely an Asian demographic as well. Hurstville is the same,” he said. 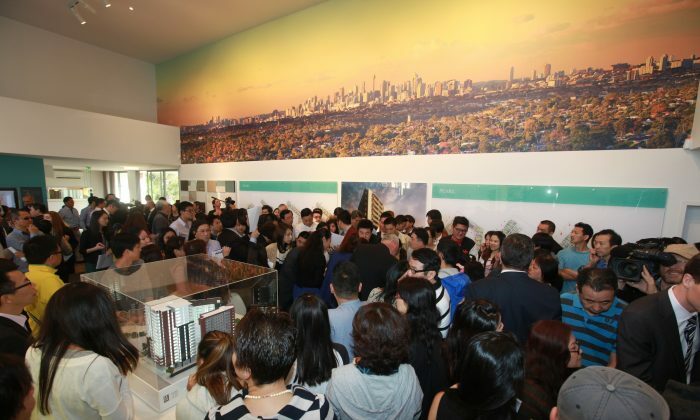 Tim Rees, senior director for CBRE Residential Projects and agent for Highpoint, said that 95 to 100 per cent of the buyers on Oct 12 were local Chinese. He said the strength of local demand meant that the development did not need to be launched overseas. “Chinese buyers love buying off the plan, they love to be first, they love real estate and they love Sydney,” Mr Rees said.